“Noisemakers” was my third published work of short fiction. It followed the 1994 publication of “Night Remedy” in a small Nashville literary journal titled Face the Demon, as well as “Sunbather” in the 1995 Williamson County literary anthology Our Voices. Similar to “Sunbather,” it was a brutal revenge story that followed two party type collegians who enjoy playing really loud music at all hours of the day and night. Unfortunately, a brooding, quiet type who dabbles in the dark arts lives in the apartment below them. And he’s none to happy about their persistent partying. Following the publication of “Noisemakers,” I drifted away from writing fiction for a while. I chose instead to focus my energy on my journalism and IT career paths. Alas, I cannot seem to find any online remnants of artisan except for its record at Duotrope. However, the journal appears to have survived well beyond the mid-1990s and into the Internet publishing era. 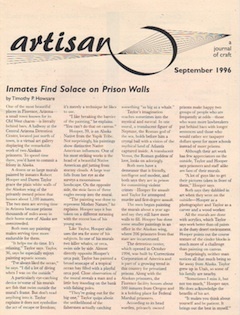 As of this writing, the latest Duotrope cover image for artisan appears to be from 2007.